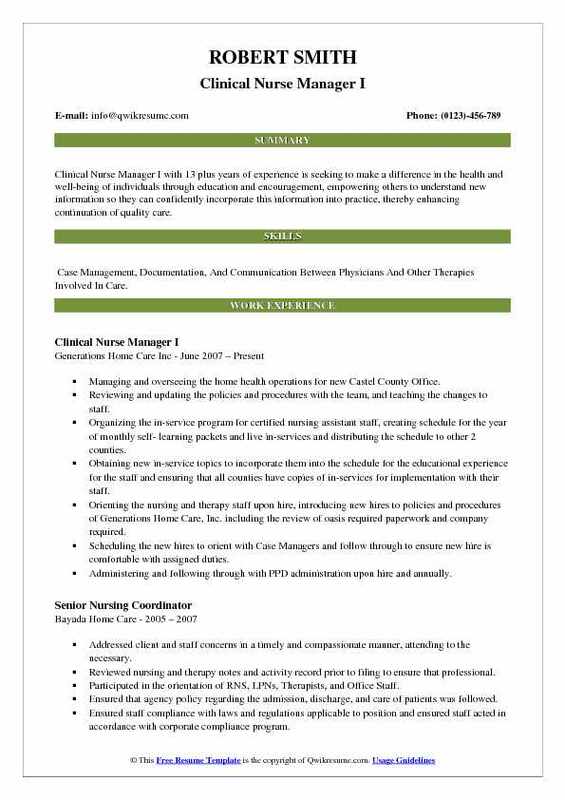 Clinical Nurse Manager takes charge of organizing, directing and supervising the workflow of registered nurses, licensed practical nurses, and registered nurses. 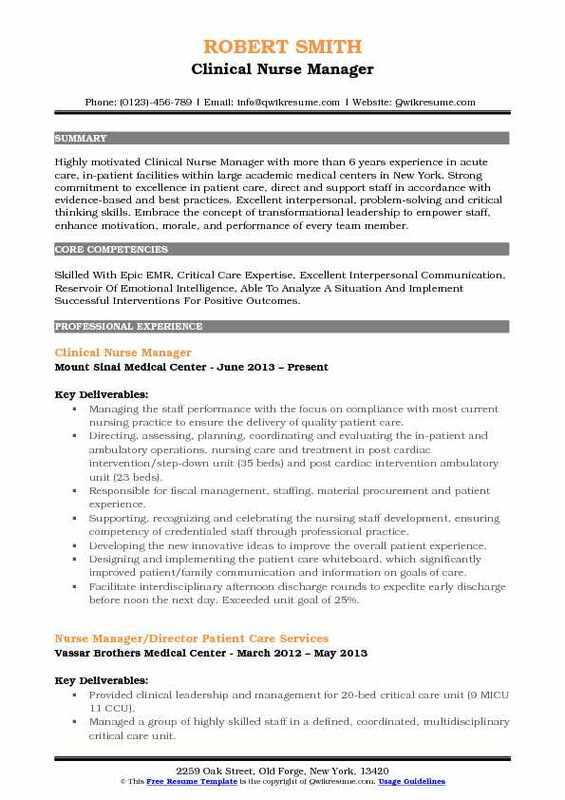 A well accentuated Clinical Nurse Manager Resume incorporates job duties that include – ensuring effective patient care and quality standards are satisfied, evaluating the performance of staff nurses, providing feedback, mentoring and developing education programs, contributing towards professional development, developing departmental budgets and maintaining inventories of medical equipment, supplies, and medicines. The Clinical Nurse Manager is required to possess qualities such as nursing expertise, communicative skills, and interpersonal skills. Additionally, these professionals are required to have an in-depth knowledge of hospital procedures and have a thorough familiarity with best practices in healthcare. 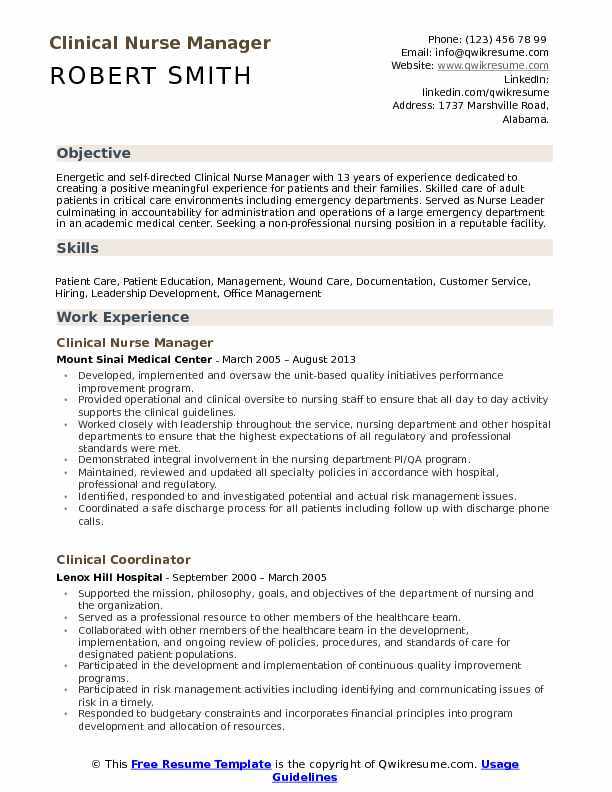 Apart from holding a valid nursing license, these clinical nurse managers are supposed to mention in the resume a nursing degree. Summary : Energetic and self-directed Clinical Nurse Manager with 13 years of experience dedicated to creating a positive meaningful experience for patients and their families. Skilled care of adult patients in critical care environments including emergency departments. 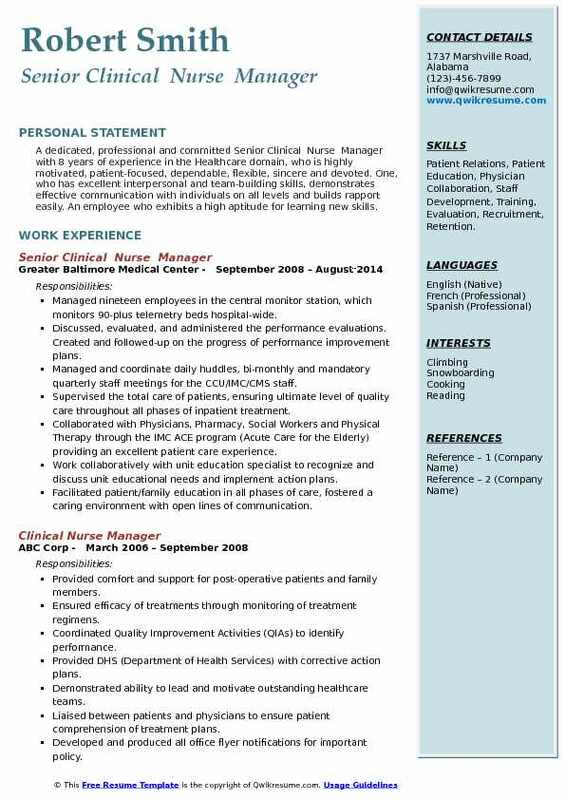 Served as Nurse Leader culminating in accountability for administration and operations of a large emergency department in an academic medical center. 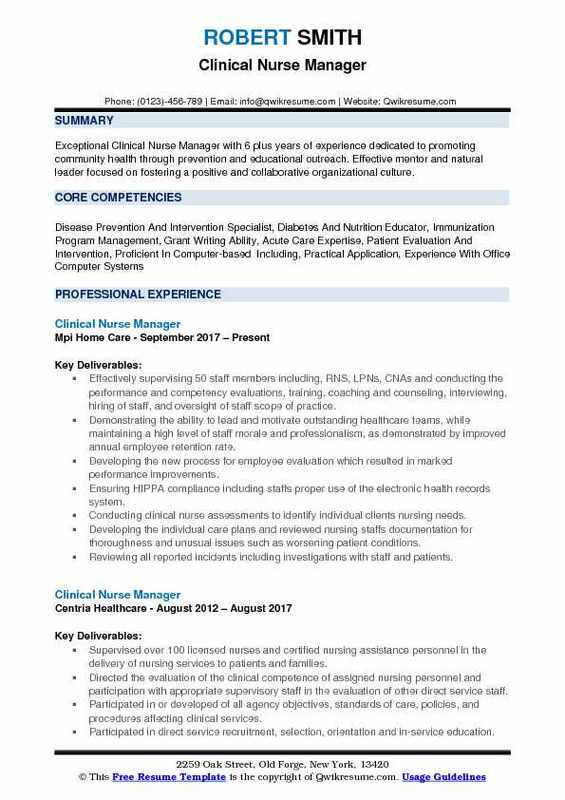 Seeking a non-professional nursing position in a reputable facility. Developed, implemented and oversaw the unit-based quality initiatives performance improvement program. Provided operational and clinical oversite to nursing staff to ensure that all day to day activity supports the clinical guidelines. Worked closely with leadership throughout the service, nursing department and other hospital departments to ensure that the highest expectations of all regulatory and professional standards were met. Demonstrated integral involvement in the nursing department PI/QA program. Maintained, reviewed and updated all specialty policies in accordance with hospital, professional and regulatory. Identified, responded to and investigated potential and actual risk management issues. Coordinated a safe discharge process for all patients including follow up with discharge phone calls. Headline : Exceptional Clinical Nurse Manager with 6 plus years of experience dedicated to promoting community health through prevention and educational outreach. Effective mentor and natural leader focused on fostering a positive and collaborative organizational culture. Effectively supervising 50 staff members including, RNS, LPNs, CNAs and conducting the performance and competency evaluations, training, coaching and counseling, interviewing, hiring of staff, and oversight of staff scope of practice. Demonstrating the ability to lead and motivate outstanding healthcare teams, while maintaining a high level of staff morale and professionalism, as demonstrated by improved annual employee retention rate. Developing the new process for employee evaluation which resulted in marked performance improvements. Ensuring HIPPA compliance including staffs proper use of the electronic health records system. Conducting clinical nurse assessments to identify individual clients nursing needs. Developing the individual care plans and reviewed nursing staffs documentation for thoroughness and unusual issues such as worsening patient conditions. Reviewing all reported incidents including investigations with staff and patients. Initiated policies to address areas of concern for process improvement. Ensuring regulatory standards are being met for all clinical and non-clinical areas under my direction. 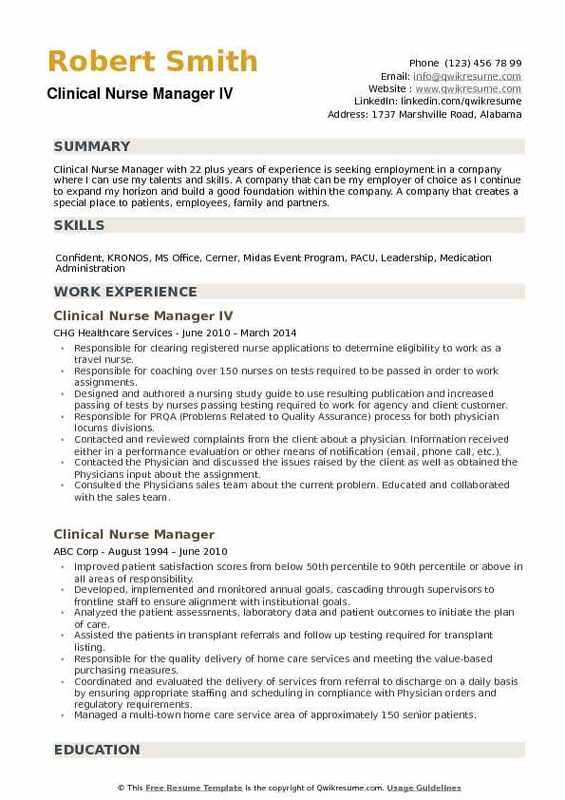 Summary : Clinical Nurse Manager I with 13 plus years of experience is seeking to make a difference in the health and well-being of individuals through education and encouragement, empowering others to understand new information so they can confidently incorporate this information into practice, thereby enhancing continuation of quality care. Skills : Case Management, Documentation, And Communication Between Physicians And Other Therapies Involved In Care. Managing and overseeing the home health operations for new Castel County Office. Reviewing and updating the policies and procedures with the team, and teaching the changes to staff. Organizing the in-service program for certified nursing assistant staff, creating schedule for the year of monthly self- learning packets and live in-services and distributing the schedule to other 2 counties. Obtaining new in-service topics to incorporate them into the schedule for the educational experience for the staff and ensuring that all counties have copies of in-services for implementation with their staff. Orienting the nursing and therapy staff upon hire, introducing new hires to policies and procedures of Generations Home Care, Inc. including the review of oasis required paperwork and company required. Scheduling the new hires to orient with Case Managers and follow through to ensure new hire is comfortable with assigned duties. Administering and following through with PPD administration upon hire and annually. Supervising, monitoring, supporting and teaching the nursing staff on established procedures, clinical information and company policies. Meeting with staff one on one to discuss individual needs as they arise. 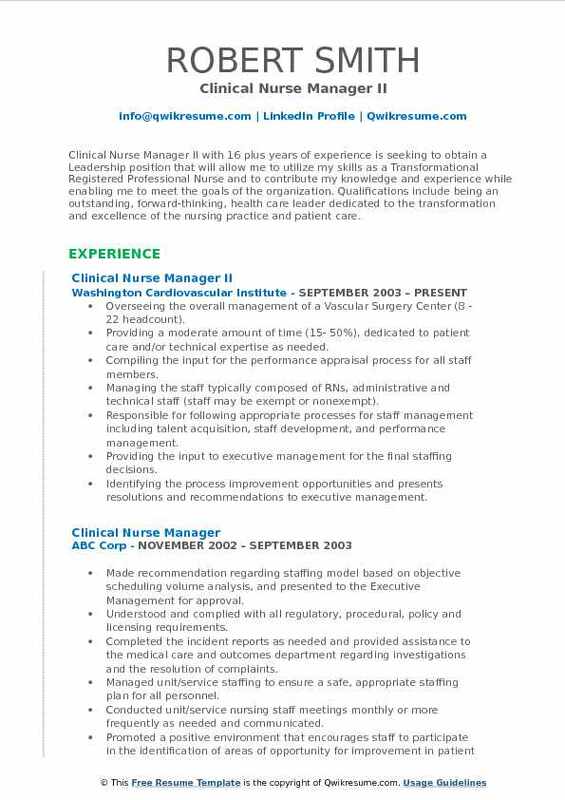 Summary : Clinical Nurse Manager II with 16 plus years of experience is seeking to obtain a Leadership position that will allow me to utilize my skills as a Transformational Registered Professional Nurse and to contribute my knowledge and experience while enabling me to meet the goals of the organization. Qualifications include being an outstanding, forward-thinking, health care leader dedicated to the transformation and excellence of the nursing practice and patient care. Overseeing the overall management of a Vascular Surgery Center (8 - 22 headcount). Providing a moderate amount of time (15- 50%), dedicated to patient care and/or technical expertise as needed. Compiling the input for the performance appraisal process for all staff members. Managing the staff typically composed of RNs, administrative and technical staff (staff may be exempt or nonexempt). Responsible for following appropriate processes for staff management including talent acquisition, staff development, and performance management. Providing the input to executive management for the final staffing decisions. Identifying the process improvement opportunities and presents resolutions and recommendations to executive management. Executed the daily flow of patients and families by managing to schedule in a busy primary care practice with 14 physicians. Summary : A dedicated, professional and committed Senior Clinical Nurse Manager with 8 years of experience in the Healthcare domain, who is highly motivated, patient-focused, dependable, flexible, sincere and devoted. One, who has excellent interpersonal and team-building skills, demonstrates effective communication with individuals on all levels and builds rapport easily. An employee who exhibits a high aptitude for learning new skills. Skills : Patient Relations, Patient Education, Physician Collaboration, Staff Development, Training, Evaluation, Recruitment, Retention. Managed nineteen employees in the central monitor station, which monitors 90-plus telemetry beds hospital-wide. Discussed, evaluated, and administered the performance evaluations. Created and followed-up on the progress of performance improvement plans. Managed and coordinate daily huddles, bi-monthly and mandatory quarterly staff meetings for the CCU/IMC/CMS staff. Supervised the total care of patients, ensuring ultimate level of quality care throughout all phases of inpatient treatment. Collaborated with Physicians, Pharmacy, Social Workers and Physical Therapy through the IMC ACE program (Acute Care for the Elderly) providing an excellent patient care experience. Work collaboratively with unit education specialist to recognize and discuss unit educational needs and implement action plans. Facilitated patient/family education in all phases of care, fostered a caring environment with open lines of communication. Promoted and maintained the unified and spirited workplace with a commitment to valued teamwork. Increased the yearly scores for GBMC culture of safety survey and employee satisfaction survey. 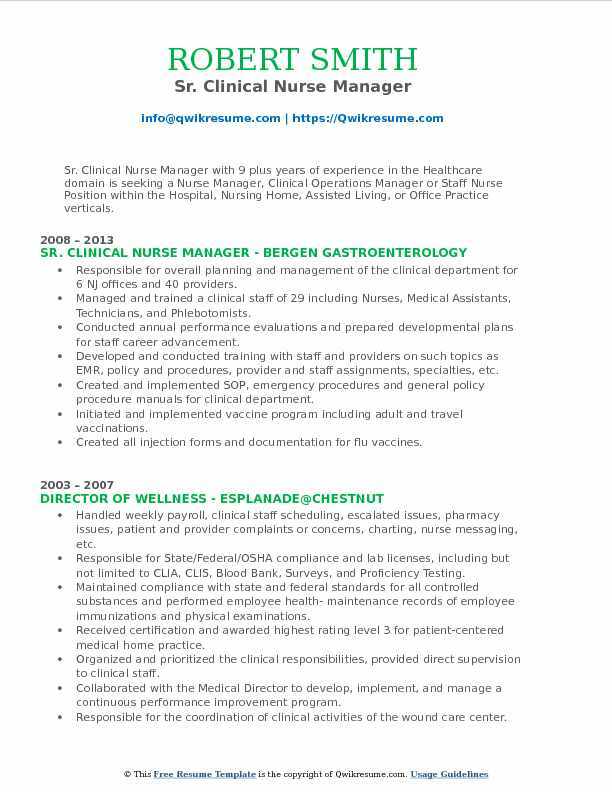 Summary : Clinical Nurse Manager III with 18 plus years of experience in the Healthcare domain is seeking an opportunity in nurse management that utilizes my vast knowledge, experience, and dedication in this field. Leading the daily operations of the clinical staff to achieve quality care and performance of an interdisciplinary team. Maintaining the structure and staffing of approximately 18 FTEs to effectively meet the needs of a 24 hour/365 day urgent care facility. Maintaining the structure and staffing of 20 FTEs to effectively meet the needs of a busy 13 physician primary care practice. Developing and implementing the protocols to improve staff training, clinical practice, and administration thereof collaborating with professional staff to coordinate continuous improvement of patient care. Maintaining the quality controls to adhere to practice standards in an ambulatory care and primary care setting. Collaborating with ancillary services (ie. Radiology and laboratory) to ensure patient and provider satisfaction. Maintaining and auditing the extensive immunization process in coordination with MCIR. Responsible for the hiring, evaluating and discipline of all clinical staff. Conducting and facilitating the regular staff meetings and educational programs. Responsible for ordering/management of departmental equipment and stock within allotted budgetary constraints. Summary : Sr. Clinical Nurse Manager with 9 plus years of experience in the Healthcare domain is seeking a Nurse Manager, Clinical Operations Manager or Staff Nurse Position within the Hospital, Nursing Home, Assisted Living, or Office Practice verticals. Responsible for overall planning and management of the clinical department for 6 NJ offices and 40 providers. Managed and trained a clinical staff of 29 including Nurses, Medical Assistants, Technicians, and Phlebotomists. Conducted annual performance evaluations and prepared developmental plans for staff career advancement. Developed and conducted training with staff and providers on such topics as EMR, policy and procedures, provider and staff assignments, specialties, etc. Created and implemented SOP, emergency procedures and general policy procedure manuals for clinical department. Initiated and implemented vaccine program including adult and travel vaccinations. Created all injection forms and documentation for flu vaccines. Managed and set up all clinical departments in new offices. Handled all-new provider orientations and training including new specialties added to practice such as Cardiology, Neurology, Endocrinology, and Rheumatology. Training included but not limited to SRS, Micro MD, Clinical Equipment, Shiel, Scripts and Lab Sheets. Responsible for all operational and administrative duties for all 6 offices including ordering medical supplies, pricing, researching, purchasing and invoicing. Responsible for overall management of staff. Facilitated weekly and daily staff meetings. 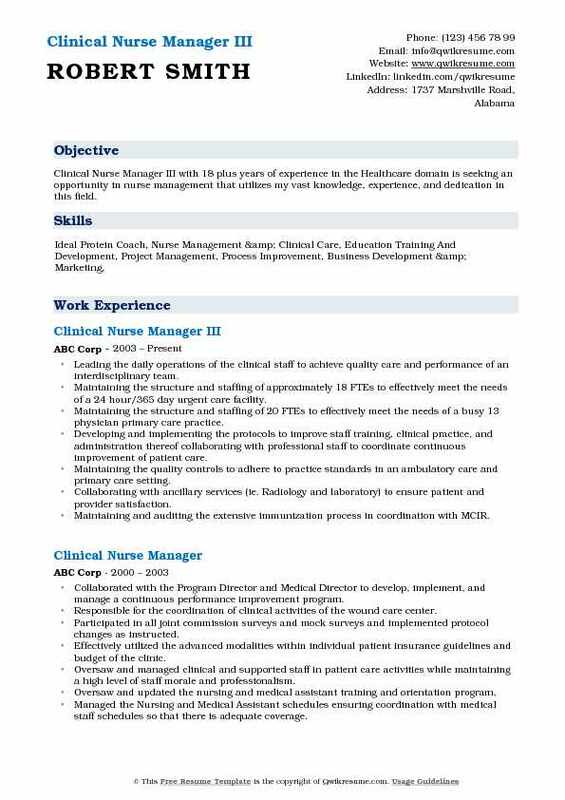 Headline : Highly motivated Clinical Nurse Manager with more than 6 years experience in acute care, in-patient facilities within large academic medical centers in New York. Strong commitment to excellence in patient care, direct and support staff in accordance with evidence-based and best practices. Excellent interpersonal, problem-solving and critical thinking skills. Embrace the concept of transformational leadership to empower staff, enhance motivation, morale, and performance of every team member. Skills : Skilled With Epic EMR, Critical Care Expertise, Excellent Interpersonal Communication, Reservoir Of Emotional Intelligence, Able To Analyze A Situation And Implement Successful Interventions For Positive Outcomes. Managing the staff performance with the focus on compliance with most current nursing practice to ensure the delivery of quality patient care. Directing, assessing, planning, coordinating and evaluating the in-patient and ambulatory operations, nursing care and treatment in post cardiac intervention/step-down unit (35 beds) and post cardiac intervention ambulatory unit (23 beds). Responsible for fiscal management, staffing, material procurement and patient experience. Supporting, recognizing and celebrating the nursing staff development, ensuring competency of credentialed staff through professional practice. Developing the new innovative ideas to improve the overall patient experience. Designing and implementing the patient care whiteboard, which significantly improved patient/family communication and information on goals of care. Facilitate interdisciplinary afternoon discharge rounds to expedite early discharge before noon the next day. Exceeded unit goal of 25%. Actively participated in reviewing core measures to ensure compliance with regulatory agencies guidelines. Worked closely with staff to help them "connect to purpose" by improving their understanding of how what they do each day connects to the mission of the organization. Summary : Clinical Nurse Manager with 10 plus years of experience is seeking to gain further expertise with nursing/administration in the community by offering strong management and leadership skills through teamwork, self-initiative and enhanced customer satisfaction. Responsible for the start-up of three (3) brand new ambulatory urgent care centers through university hospitals. Responsible for day to day operations of the urgent care including scheduling, payroll, general ledger management, supply ordering, accounts payable, medical record requests, insurance verification along with workman's comp and corporate health services risk management. Working with various departments including Lab, Radiology and other Physician groups to ensure patient needs are not only met but also exceeded. Participating in various system management groups including infection control committee, health safety committee, nursing council on-going compliance training. Assisting in medical coding, billing, and on-going chart reviews to ensure continuous quality improvement with documentation. Conducting the monthly staff meetings and in-services based on learning needs assessment of staff. Assisting in creating a nursing administrative manual and nursing protocol manual to help staff maintain standards of care, and hold staff accountable for providing proper care to our patients. 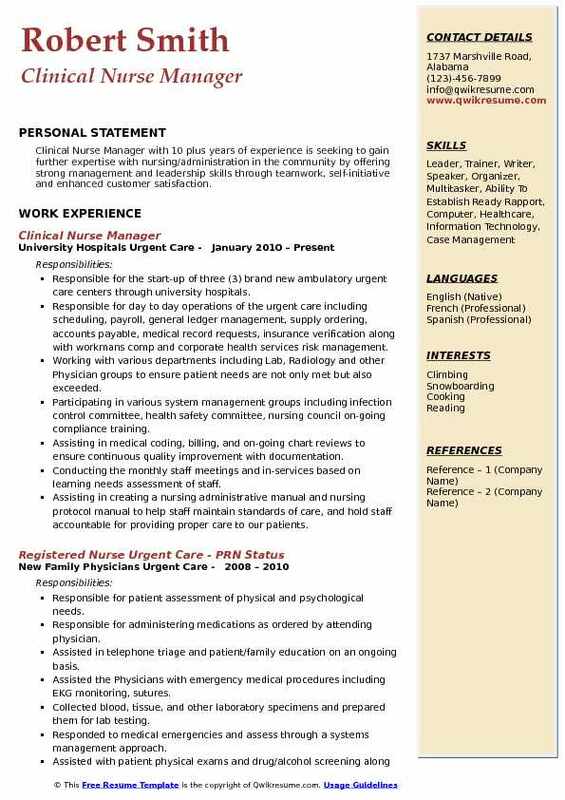 Summary : Clinical Nurse Manager with 22 plus years of experience is seeking employment in a company where I can use my talents and skills. A company that can be my employer of choice as I continue to expand my horizon and build a good foundation within the company. A company that creates a special place to patients, employees, family and partners. Responsible for clearing registered nurse applications to determine eligibility to work as a travel nurse. Responsible for coaching over 150 nurses on tests required to be passed in order to work assignments. Designed and authored a nursing study guide to use resulting publication and increased passing of tests by nurses passing testing required to work for agency and client customer. Responsible for PRQA (Problems Related to Quality Assurance) process for both physician locums divisions. Contacted and reviewed complaints from the client about a physician. Information received either in a performance evaluation or other means of notification (email, phone call, etc.). Contacted the Physician and discussed the issues raised by the client as well as obtained the Physician's input about the assignment. Consulted the Physician's sales team about the current problem. Educated and collaborated with the sales team. Made determination about continuing to work the Physician. Credentialing file, work history as well as history with either physician locums companies are reviewed. Maintained the database that is allocated for each PRQA issue generated.